Everything you heard about life, the Universe, and everything else is wrong. Yes, wrong. Misheard Lyrics examines the ways we misunderstand the world. It is an irreverent and often hilarious novel about misheard lyrics, religion, messiahs, friendship, and the nature of the universe. Each chapter title involves a misheard song lyric, and many are discussed in context throughout the novel. Charles, an agnostic newspaper columnist and struggling novelist, and Chip, a jovial minister who swears like a sailor and runs a Haitian United Methodist church in Miami, discuss Charles’ various attempts at writing a book about messiahs. The pair’s wide-ranging topics include the origin of religion, faith vs. science, dogma, evil, magic, existentialism, the end of the world, the meaning of swearing, masturbation, astrophysics’ discoveries about the Universe, post-traumatic stress disorder, gay marriage, and whether we’re all really just living in a computer simulation. The book alternates Charles’ attempts at starting his book with the pair’s discussions about the book and religion in general as well as biographical flashbacks from Charles’ life that feature other characters. Edie was Charles’ girlfriend back in 1975. PSTD from her tour in Viet Nam as a photographer for Look magazine complicated their relationship. Karen was Charles’ wife until her lesbian romance with Munch caused their divorce and Charles’ subsequent hatred of gays. Steve was Charles’ piano virtuoso friend reduced to bankruptcy and working odd jobs. Poet Allen Ginsberg also appears as Charles’ mentor. Along the way, Charles’ blog posts and columns for the Miami Herald give insight into his agnosticism and other extreme beliefs. I started writing in third grade (mostly stories about mowing down Nazis) and was editor of my sixth-grade newsletter. Years later I went to graduate school for poetry writing, studied under Allen Ginsberg, and produced a poetry magazine, Plainspeak. Subsequently, I wrote two cancer newsletters for Duke University Cancer Center and software manuals and training programs for The Nielsen Company. I have written two book series about social media and social selling and contributed technical chapters about the Internet to two widely-published books and several national magazines. I have also written numerous white papers. But I enjoy fiction writing the most. 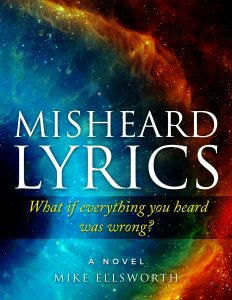 Fascinated by the way people misinterpret lyrics and the messages of songs, I started my first novel, Misheard Lyrics in 1989, believe it or not, and chipped away at it infrequently until 2015. I decided at that time that I should take the advice I had given to a friend who “couldn’t find time” to write his own novel: You’ve got time. You’ve got a half an hour a day. Just write something. So I did. With the help of that friend, I managed to finish Misheard Lyrics on Christmas Day, 2017. I was inspired to write Misheard Lyrics because of my skepticism about the Jesus story. The Apostles seemed to me to be unreliable narrators, often differing in descriptions of key events. Jesus seemed like a cool guy, but we never got to see much of the human side of him. He got mad only once when he threw the money changers out of the temple and got a little annoyed at his mom in the water to wine story. But that’s it. When writing daily, I often can’t think of anything to write pertinent to the novel. So I just write in a stream of consciousness manner. Most times that inspires a relevant thought and I’m off to the races. I also find working on may different chapters at once to be very effective. My favorite authors are Neal Stephenson, Isaac Asimov, David Foster Wallace, Margaret Atwood, Bruce Sterling, William Gibson, Carl Hiassen, and Ernest Hemingway. I am now working on a novel about a character I spun out of Misheard Lyrics. I fell in love with her and look forward to seeing where her journey will lead.